Ceramics is a discipline with which I have been involved since 1972. 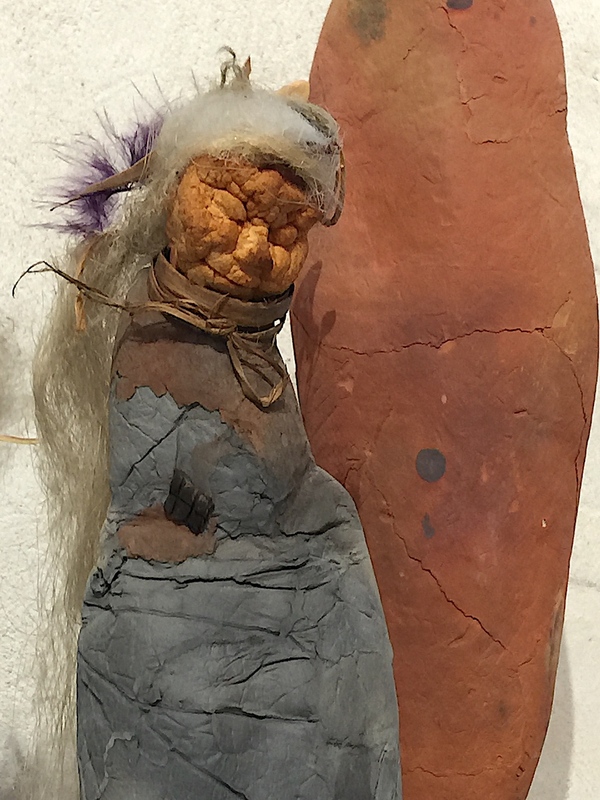 In 1987, I began to use a technique of layering various textiles and paper, with clay. Dry but still raw, the pieces are once-fired in a custom-made wood-fired 'kiln'. The top, a hive-like dome, is also made with layers of paper and clay, constructed for each firing according to the work inside, thus always a different shape and experience. No other process is involved, except to add salts to the fire itself. This single primitive firing is a well-loved but unpredictable process, truly giving work up to the 'god' of the kiln. The finished pieces are fragile, and should project a primitive power. The use of textile is not centered on imprint (although I must consider it), rather on structure. The layers create a unique surface, raw and archeological. I have been tempted by Peeled (or Naked) Raku. These are the black and white, or black/rose pieces, found in Objects. The resulting marks are actually varying degrees of protection from smoke, and of no smoke. Jewellery has been a long-term project, combining with pleasure the coarse earthy clay with gold threads (and with leather, textiles, rubber). I see them as precious objects, not necessarily to be worn, for reasons of fragility and practicality. Monoprints. A print-making process resulting in a single, if complex, image, developed through multiple applications of one/the same paper on the support. The negative of a print is frequently used as a point of depart. Supports are glass and metal; using ink, guache, oils, and water-based oils; usually in series with a specific theme. Subjects have been the Figure; the House; an Abstract reflection on Memory - exploring what is retained, and how that changes, becomes more sharp, or fades and fades again; a reflection on Change. Many of these prints are paired with another, in simple collage. Current work involves, once again, layers... of images printed on nearly transparent paper. Photography has shifted from close-up and detailed, to FUSION PHOTOS, a passionate engagement (see under New Work... FUSION PHOTO, FUSION PHOTO SERIES, and FUSION PHOTOS PAST SERIES), where multiple photos AND/OR monoprints/monotypes are fused together in search of a complex and painterly surface. See also New Work, Expositions 2017/2018.